Purple onions, also called red onions, offer a healthy way to give your meals more flavor and provide nutrients without adding many calories. These onions also provide phytochemicals, or beneficial plant chemicals, that may help lower your risk for certain health problems. The research is still preliminary, however, and it isn't clear just how much onion you need in order to experience these potential benefits. A tablespoon of chopped onion has just 4 calories, a large slice has 15 calories and a whole small onion has about 28 calories. A small onion also provides 9 percent of the daily value for vitamin C, which you need for forming collagen and healing wounds, and 5 percent of the DV for manganese, a mineral essential for proper bone development and metabolism. 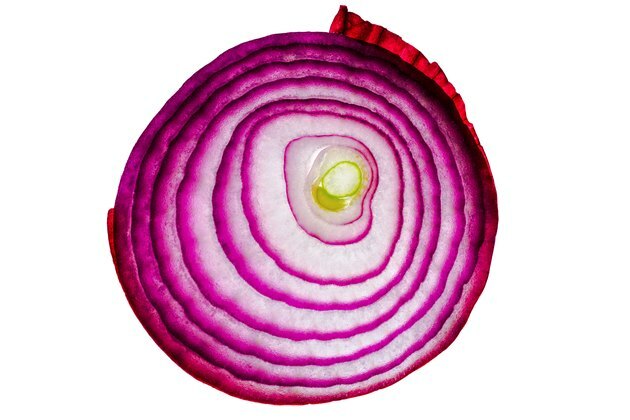 Purple onions get their color from beneficial plant chemicals called anthocyanins. They also provide you with quercetin and sulfur, which is responsible for the smell of the onion, its flavor and the tears people often experience when cutting onions. Anthocyanins are antioxidants that help prevent cell damage, keep your heart healthy and may lower your risk for cancer. Quercetin acts as an antioxidant and an anti-inflammatory, helping limit your risk for cancer and heart disease. The sulfur compounds found in onions may help lower your risk for cancer by minimizing the growth and spread of tumors, according to an article published in the "Asian Pacific Journal of Cancer Prevention" in 2004. Eating red onion may help lower your blood sugar, according to an article published in "Environmental Health Insights" in 2010. In this study, diabetics' fasting blood sugar levels were tested four hours after eating a 100-gram serving, or about three large slices, and found to have decreased significantly. An animal study, published in "Plant Foods in Human Nutrition" in December 2006, found that eating onions may help lower triglycerides and improve other heart disease risk factors in those eating a high-fat diet. Further research is needed to confirm these potential benefits apply to people as well. If you're using onions raw, as they are often eaten, an article published in the "New York Times" in June 2010 recommends rinsing the onions after you chop them to improve their flavor. For cooked onions, the article notes that the more finely you chop the onions, the stronger their flavor will be. You can pickle red onions and add them to sandwiches or serve them as a side dish, use them raw in salads and salsas or top a pizza with them and other vegetables. Red onions can be used in place of white or yellow onions in most recipes.